Garnet is the traditional birthstone for January. The name "garnet" comes from 14th century Middle English word gernet meaning 'dark red'. 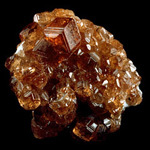 The garnet group includes a group of minerals that have been used since the Bronze Age as abrasives and gemstones. Garnets can be found in many different colours including red, orange, yellow, green, blue, purple, brown, black, pink and colorless. The rarest colour for a garnet is the blue garnet, discovered in the late 1990s in Bekily, Madagascar it is also found in parts of the USA, Turkey and Russia. It changes color from blue-green in the daylight to purple in incandescent light, as a result of the relatively high amounts of vanadium. Other varieties of color-changing garnets do exist. In daylight, their colour ranges from shades of green, beige, brown, grey and blue. But in incandescent light, they appear a reddish or purplish/pink colour. Because the chemical composition of garnet varies, the atomic bonds in some species are stronger than in others. As a result, this mineral group shows a range of hardness on the Mohs scale of about 6.5 to 7.5. Amethyst is the traditional birthstone for February. Amethyst is a violet variety of quartz often used in jewellery. 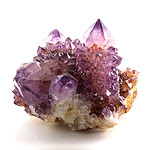 The name comes from Ancient Greece, a reference to the belief that the stone protected its owner from drunkenness; the ancient Greeks and Romans wore amethyst and believed that it would prevent them from intoxication. The medieval European soldiers wore amethyst amulets for protection when in battle. The ideal grade is called "Deep Siberian" and has a primary purple hue of around 75–80%, 15–20% blue and (depending on the light source) red secondary hues. Amethyst is produced in abundance in Brazil where it occurs in large geodes within volcanic rocks. It is also found and mined in South Korea. The largest opencast amethyst vein in the world is in Maissau, Lower Austria. Much fine amethyst comes from Russia, especially from near Mursinka in the Ekaterinburg district, where it occurs in drusy cavities in granitic rocks. Many localities in south India yield amethyst. One of the largest global amethyst producers is Zambia in southern Africa with an annual production of around 1000 tones. This mineral group shows a range of hardness on the Mohs scale of 7. Aquamarine is the traditional birthstone for March and name derived from Latin which translates to "sea water". Aquamarine is a blue or turquoise variety of beryl family. It occurs at most localities which yield ordinary beryl. The gem-gravel placer deposits of Sri Lanka contain aquamarine. Clear yellow beryl, such as that occurring in Brazil, is sometimes called aquamarine chrysolite. The deep blue version of aquamarine is called maxixe. Its colour fades to white when exposed to sunlight or is subjected to heat treatment, though the colour returns with irradiation. In the United States, aquamarines can be found at the summit of Mt. Antero in the Sawatch Range in central Colorado. In Wyoming, aquamarine has been discovered in the Big Horn Mountains, near Powder River Pass. In Brazil, there are mines in the states of Minas Gerais, Espírito Santo, and Bahia, and minorly in Rio Grande do Norte. 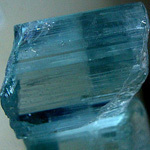 The Mines of Colombia, Zambia, Madagascar, Malawi, Tanzania and Kenya also produce aquamarine. The largest aquamarine of gemstone quality ever mined was found in Marambaia, Minas Gerais, Brazil, in 1910. It weighed over 110 kg, and its dimensions were 48.5cm long and 42cm in diameter. This mineral group shows a range of hardness on the Mohs scale of 7.5 to 8. Diamond is the traditional birthstone for April. 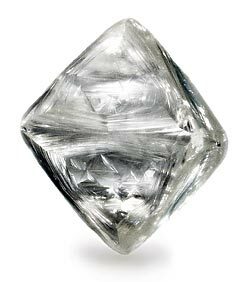 The name "diamond" comes from the Greek word "adamas" meaning "proper", "unalterable", "unbreakable", "untamed", "I overpower", "I tame". Diamond was first thought to be discovered about 2,500 years ago in India. Although diamonds are associated with being a colourless stone, they are occasionally found with a strong, bright colour-green, red, pink, blue, canary yellow and amber. These "fancy" coloured diamonds are rare and very expensive compared to the normal white diamonds most commonly seen in the jewellery stores today. Approximately 130,000,000 carats of diamonds are mined annually, with a total value of nearly US$9 billion. Roughly 49% of diamonds originate from Central and Southern Africa, although significant sources of the mineral have been discovered in Canada, India, Russia, Brazil, and Australia. Diamond is the hardest known natural material on the Mohs scale of mineral hardness, where hardness is defined as resistance to scratching and is graded between 1 (softest) and 10 (hardest). Diamond has a hardness of 10 (hardest) on this scale. Emerald is the traditional birthstone for May. The name Emerald comes from the Greek word "smaragdos" meaning green gem. Traditionally emerald was regarded as one of the five most precious gemstones. 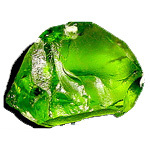 One of the main characteristics of most natural emeralds is that they are heavily included. These inclusions are not always to be seen as a bad thing, the poetic word "jardins" is used to describe them which means "gardens" in French. Unfortunately these "jardins" are the reason why emeralds are known to be fragile as there inclusions create planes of weakness within the gemstone. 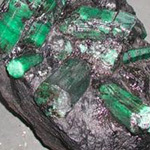 Emeralds are found in many countries, such as Afghanistan, Australia, Austria, Brazil, Bulgaria, Cambodia, Canada, China, Colombia, Egypt, Ethiopia, France, Germany, India, Italy, Kazakhstan, Madagascar, Mozambique, Namibia, Nigeria, Norway, Pakistan, Russia, Somalia, South Africa, Spain, Switzerland, Tanzania, United States, Zambia and Zimbabwe. In the US, emeralds have been found in Connecticut, Montana, Nevada, North Carolina and South Carolina. This mineral group shows a range of hardness on the Mohs scale of 7 to 7.5. Pearl is the traditional birthstone for June. Pearls are regarded as one of the five precious gemstones. They are treasured for their iridescent lustre known solely to pearls as "orient". Their orient is a reflection of the quality of the "nacre" or "mother of pearl" which is the coating that is seen on the outside of the pearl. The higher the quality of the nacre, the higher the quality of the orient and pearl itself. Naturally occurring pearls are becoming exceedingly rare and account for only a small fraction of worldwide pearl sales. Due to the overwhelming popularity of pearls, pearl farmers had to devise a way of producing cultured pearls. Cultured pearls are still grown in certain species of oysters and mussels like their natural counterparts. However man has intervened and initiated the growth of the pearl. These pearls are more commonly known as freshwater pearls. The unique luster of pearls depends upon the reflection, refraction, and diffraction of light from the translucent layers. The thinner the layer of nacre on the pearl produces the finest luster. The iridescence that pearls display is caused by the overlapping of successive layers, which breaks up light falling on the surface. In addition, pearls (especially cultured freshwater pearls) can be dyed yellow, green, blue, brown, pink, purple, or black. The very best pearls have a metallic mirror-like luster. 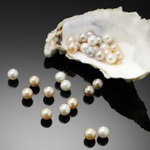 Pearls show a range of hardness on the Mohs scale of 2.5 to 4.5. Ruby is the traditional birthstone for July. A ruby varies from a pink to blood-red coloured gemstone. Its name comes from "ruber", which is Latin for red. All natural rubies have inclusions in them, including colour impurities and inclusions of rutile needles known as "silk". Fine quality rubies are known to be rare above three carats and are more valuable than all other coloured gemstones with the exception of Alexandrite. It can often be more valuable than a equivalent white diamond. When gemologists study a ruby they use the rutile needle inclusions found in natural rubies to distinguish them from synthetics, simulated, or substitutes. Usually the ruby is heat treated in the rough before cutting. Almost all rubies today are treated in some form, with heat treatment being the most common practice. However, rubies that are completely untreated but still of excellent quality command a large premium. The Mogok Valley in Upper Myanmar (Burma) was for centuries the world's main source for rubies. However rubies have historically been mined in Thailand, the Pailin and Samlout District of Cambodia, Burma, India, Afghanistan and in Pakistan. 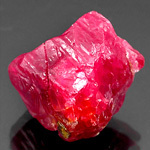 In Sri Lanka, lighter shades of rubies (often "pink sapphires") are more commonly found. After the Second World War ruby deposits were found in Tanzania, Madagascar, Vietnam, Nepal, Tajikistan, and Pakistan. More recently, large ruby deposits have been found under the receding ice shelf of Greenland. In 2002 rubies were found in the Waseges River area of Kenya. This mineral group shows a range of hardness on the Mohs scale of 9. Peridot is the traditional birthstone for August. Peridot is from the mineral "olivine" and has been used as a gemstone for over 3500 years. Peridot is one of the few gemstones that occur in only one colour, an olive green. The intensity of the green colour depends on how much iron is contained in the crystal structure. So the colour of individual Peridot gems can vary from yellow to olive to brownish green. The most valued colour is a dark olive green. It was first mined on the volcanic Red Sea island of Zebireget off the coast of Egypt. Many of the emeralds that were used in Cleopatra's fabled emerald collection were in fact peridot from Zebireget. Peridot is also mined in Australia, Brazil, China, Kenya, Mexico, Myanmar (Burma), Norway, Pakistan, Saudi Arabia, South Africa, Sri Lanka, Tanzania and USA. This mineral group shows a range of hardness on the Mohs scale of 6.5 to 7. Sapphire is the traditional birthstone for September. The name Sapphire comes from the Greek word "blue stone" and is a gemstone variety of the mineral corundum. Sapphires are most commonly found in blue, yellow, pink, purple, orange, or greenish colour. Blue sapphires are evaluated based upon the purity of their primary hue. The colour of fine blue sapphires can be described as a vivid medium dark violet to purplish blue where the primary blue hue is at least 85% and the secondary hue no more than 15% without the least admixture of a green secondary hue or a gray mask. Yellow and green sapphires are also commonly mined. Pink sapphires deepen in colour as the quantity of chromium increases. The deeper the pink colour the higher their value is as long as the colour is towards the red of rubies. The cost of natural sapphires varies depending on their colour, clarity, size, cut, and overall quality; as well as their geographic origin. Madagascar is the world leader in sapphire production (as of 2007) specifically its deposits in and around the town of Ilakaka. Prior to the opening of the Ilakaka mines, Australia was the largest producer of sapphires (Up until 1987). Other mining locations include Afghanistan, Burma, China, India, Kenya, Pakistan, Sri Lanka, Thailand and Tanzania. Tourmaline is the traditional birthstone for October. Tourmaline is classified as a semi-precious stone and the gem comes in every shade of the rainbow and has the largest colour variation of any gemstone. The name Tourmaline comes from the Sinhalese word "Thuramali". Chrome tourmaline refers to the rich, intense green variety caused by the presence of chromium in the crystal. Some of the electric blue tourmalines gain there colouring from a heavy presence of copper and is called "Paraiba" tourmaline. These electric blue tourmalines are very rare and are the most expensive of all the tourmalines. 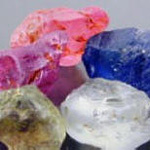 Other types of tourmalines that are most commonly seen are "bi-coloured". The most noticeable one is the watermelon tourmaline, which displays both pink and green, with a reminiscent of a cross section of watermelon. Other types of tourmaline available are yellow or golden, orange, brown, purple, black (schorl), colourless and cat's eye. Tourmaline is mined mainly in Brazil and Africa. Some placer material suitable for gem use comes from Sri Lanka. 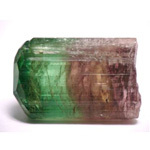 In addition to Brazil, tourmaline is mined in Tanzania, Nigeria, Kenya, Madagascar, Mozambique, Namibia, Afghanistan, Pakistan, Sri Lanka, and Malawi. 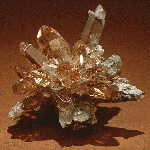 Topaz is the traditional birthstone for November. Orange topaz, also known as precious topaz, is the traditional November birthstone and is the symbol of friendship. Pure topaz is colourless and transparent but it usually has a number of impurities; typical topaz is wine, yellow, pale grey, reddish-orange, or blue brown. It can also be made white, pale green, blue, gold, pink (Which is very rare), reddish-yellow or opaque to transparent. Imperial topaz is yellow, pink (very rare, if natural) or pink-orange. Brazilian Imperial Topaz can often have a bright yellow to deep golden brown hue, sometimes even violet. Many brown or pale topazes are treated to make them bright yellow, gold, pink or violet colored. Some imperial topaz stones can fade on exposure to sunlight for an extended period of time. Naturally occurring blue topaz is quite rare. Typically, colourless, grey or pale yellow and blue material is heat treated and irradiated to produce a more desired darker blue. This mineral group shows a range of hardness on the Mohs scale of 8. Turquoise was among the first gems to be mined, and while many historic sites have been depleted, some are still worked to this day. These are all small-scale. 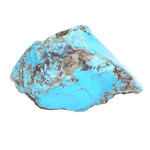 With a history of over 3000 years, turquoise was once a highly prestigious gemstone of cultures like the Persians (Iran), Egyptians, Aztecs and the Tibetans. The higher the quality turquoise came from Iran since antiquity. For Iranian architecture, the blue turquoise was used to cover the domes of the Iranian palaces because its intense blue colour was also a symbol of heaven on earth. Unfortunately, this once highly esteemed stone has had its name tarnished and desirability diminished in recent decades due to the market being flooded with them. This mineral group shows a range of hardness on the Mohs scale of 5 to 6.